Listen. I understand. You were just enjoying your vacation to Egypt, taking a nice stroll around the Valley of the Kings. You certainly didn’t intend to desecrate anything, did you? No, of course not. And when you stumbled — by accident, of course — into the tomb of Sheteptawy, did you mean to break a couple a of canopic jars? No. That would be ridiculous. But it’s what happened, and now you need to deal with it. You broke those jars, and now you’re under Sheteptawy’s curse. So we have a couple of options here: either you can spend the rest of your life in abject terror because that old priest of Set is about to shamble around the next corner, arms outstretched, with his dead eyes filled with the certitude of his revenge, or we can take steps to keep you safe. And I have just the solution: Ecosmart Fire. Stop crying. Everyone knows that mummies hate fire. I mean, well, I guess everybody hates fire, but mummies? Mummies are literally dried-out corpses from the middle of the desert. They’ll go up like kindling. 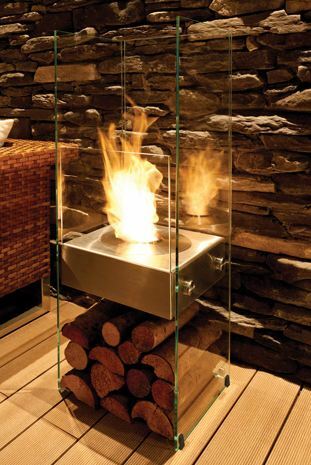 So the best way to feel safe is to trick out your house with these bioethanol indoor fireplaces that flame up with the flip of a switch. If Shetaptawy does go ahead and show up, you just turn these babies on and he’ll run screaming into the night. Or lumber awkwardly away moaning into the night. Either way, he’ll be somebody else’s problem. And we can outfit your place in whatever mummy-deterring arrangement suits you best. They’ve got both wall-mounted and free-standing models. Tactically speaking, I think the free-standing ones give you more versatility, but there’s something to be said for the drama of having the walls set aflame at your command. Ole Sheteptawy might think you’re Ra himself when he sees the room light up with the flick of your wrist. It’s both an effective mummy deterrent and a convenient, elegant way to light your home, so I mean, this is win-win, buddy. And they’re all fueled by bioethanol, a renewable, environmentally-friendly energy source, which means that you don’t need to worry about planet Earth when you’re worrying about Numero Uno. The only emissions are heat, steam, and carbon dioxide — which is, I’m told, also effective at keeping away the undead. The bioethanol creates a beautiful dancing flame sure to terrify any mummy that sees it. And the freestanding ones don’t need any installation at all — you just set ’em up, turn ’em on, and watch as sweet security descends upon your homes: now perpetually mummy free. The best part is that, once you’ve dispatched Sheteptawy once and for all, you’ve still got the most spectacular lighting displays of anyone else in town. So maybe it’s not a curse after all!